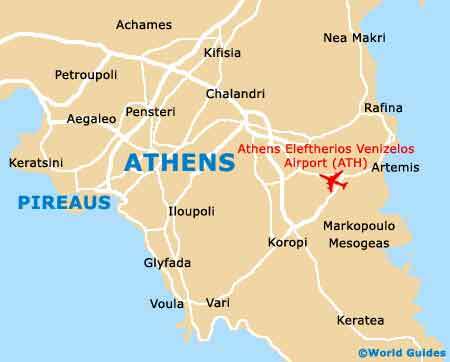 A major Greek port and amongst the biggest in the whole of the Mediterranean, Piraeus (Pireas) is an important city and often considered to be a suburb of Athens, which lies just minutes away. Piraeus has become nothing short of a hub for the ferry network travelling all around the Aegean Sea and whilst its proximity to Athens means that it often merges imperceptibly with the Greek capital, its seafront offers a very different and distinctive appearance. 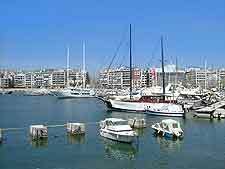 Without question, tourists will find that the most appealing area of Piraeus lies around its easterly quarter, alongside both the Mikrolimano Harbour and the Zea Marina. This seafront district is brimming with waterfront restaurants, bars and nightspots and tourism, and was greatly revamped in time for the recent Athens Olympics, with the creation of a beautiful harbourfront promenade, lined with trees and passing the medieval city walls, which offer an insight and historical information about the city's rich past. There are some very good beaches scattered around the city, with an especially good beaches being situated next to the Piraeus Peninsula. Most beaches are just a relatively short drive from Piraeus city centre and have much to offer, although for many, the city's harbours and marinas are just as charming, and packed with interest. 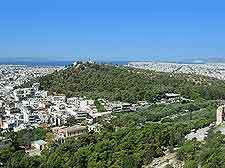 Glyfada Beach is worthy noting and has grown into a thriving seaside resort, while the gorgeous Votsalakia Beach also comes very highly recommended. 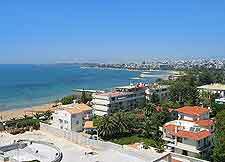 More information about Piraeus Beaches. Piraeus may not be quite able to compete with Athens in terms of sightseeing, but it does have plenty of offer tourists. The Great Harbour is a great place to spend an afternoon, being filled with glitzy yachts and cafes overlooking the waterfront. For superb views across the Saronic Gulf, head on over to the Hill of Castella, or visit the traditional Kaminia district to experience a taster of Greek life. Being in such close proximity to Athens, Piraeus played an important part in the Olympic Games of 2004, with its Peace and Friendship Stadium and Karaiskaki Stadium being used extensively during these legendary sporting events. More information about Piraeus Tourist Attractions. There are a number of impressive historical landmarks dotted around the city of Piraeus, provide much character. The Cathedral of Agia Triada is one such building and dates to the 18th century. Hard to miss is the city's acclaimed Municipal Theatre on the Korai Square, which features Neo-classical Greek architecture and regularly hosts various concerts and theatrical performances. To find out more information about the city's rich past, the Piraeus Archaeological Museum is on hand and contains a very famous statue of Apollo. More information about Piraeus Landmarks and Monuments. Piraeus offers the perfect base to explore some of Greece's very best attractions, and no tourist could be blamed for being tempted by the allure of the ancient landmarks within Athens, which include the Acropolis and the Temple of Olympian Zeus. However, to the south of Piraeus, the Temple of Poseidon at Cape Sounion makes for a great day trip, as do the nearby attractions within both Elefsina and Marathon. To escape from city life, the National Park at Mount Parnitha is quite unbeatable. 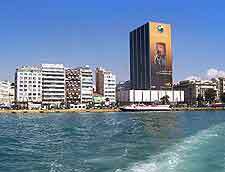 More information about Piraeus Attractions Nearby.